Trading Tuitions > Categories > General > Equities or Commodities: Which one should you Start With? Money has always been the king. Once the monetary system was established (eons ago), everyone then began to run behind what would make them look the best- lots and lots of money. That’s why it is essentially addressed as a king. From then on, people tried almost all ways to earn money and become rich. The efforts invested didn’t really matter, they just wanted plenty of money sitting under the roof of their houses. As time progressed, financial markets started. By the end of the 20th century, almost everyone who didn’t typically own a business was invested either in equities or commodities trading. 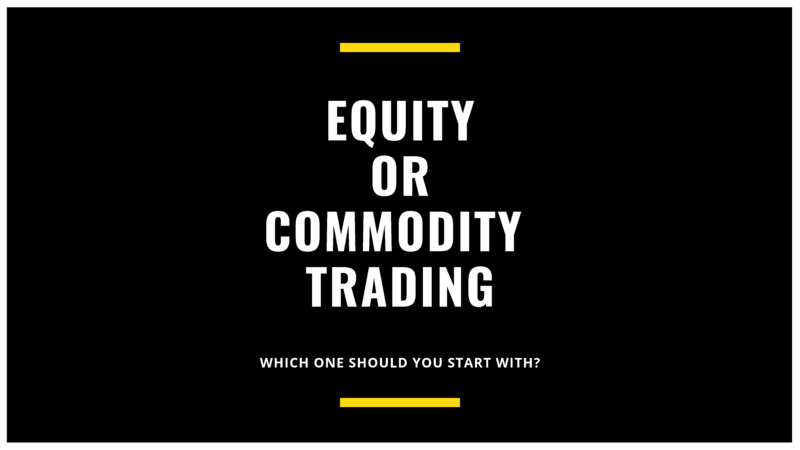 Unlike what most people think, there is a huge difference or rather points of differences to note between equities or commodities trading. Let us take a look at each one of them separately and decide which one we should trade one. These are nothing but products that don’t change their state no matter what. For instance, petrol in San Francisco would be the same as petrol in Chicago. Now that you know what are commodities, you can easily guess the benefits of commodity trading. Commodities are traded with the concept of gleaning benefits from the investment periodically. Investors usually place wagers on this to make money as the price of a good goes on to rise and fall over a period of time. Unlike equities, where you don’t have to necessarily understand half of what’s going on, you need to have a thorough understanding of the commodity in hand so that you know what to and what not to expect in future regarding the supply and demand for the same. You can purchase commodities through a commodities broker who is willing to buy and send on your behalf. These are generally bought into the future, that is, you don’t buy a product for immediate delivery but with the perspective of meeting ends in the future. To conclude about this kind of trading on a general note, when you open a commodities option contract, you get the right to buy at a certain price but the price you receive may not always be the same as it depends on the rise and fall of the value of the product in the market. This refers to the stock ownership of a company or a corporation, the methodologies of which is pretty easy to understand. Here, you are effectually buying out a part of the company along with voting rights and also the rights to extract profits in the form of dividends. You also get the right to participate in events and take leadership as if you owned the company. This is one of the most preferred investment methods as they don’t require much insight or comprehension. You can wheedle out profits when the time of the month comes up, sit back and enjoy your tidings in the meantime when work would take the company forward. You must take into account that this too depends on the kinds of profit your company generates for the month or quarter. It is prone to change with different market cycles. Also Read: How to become Stock Market Millionaire in 5 Years? Which one is the ideal option? It all depends on your passion, knowledge and risk appetite. If you have got a great hold on the commodity you are to deal with, investing in this would be a better choice. But some of the experts note that maintaining a healthy commodity equity fund is an apt option rather than limiting yourself to a single form of investment. For a beginner trader, it’s always a little safer to invest in the equities option and see slowly expand his horizon. After having gained a little understanding of the subject, he may proceed with the commodity trade and find out whether equities or commodities is best for him.